Since I've been shopping less, I've been leaning more towards my closet on what to wear and I've been loving it. I do a closet clean out just about every season and I'm so picky about what stays and goes that the items I have in my closet I really do love and want to wear more. So now I am! If you don't know, I've been doing RTR Unlimited (in-depth blog post) for maybe close to 6+ months? And I've been really loving it. Since I'm no longer in an office setting I find that I can use my membership for more of an everyday style which was an adjustment but something I found to really be liking. Last week I was invited to see The Ferryman on broadway and this was the look I decided to go with. I didn't want to wear a super bulky jacket since I'd be taking it off in a small theatre so I went with something lighter and a warmer sweater. Ever since Thanksgiving when I purchased these sweaters (have them in three colors!) I find myself always reaching for them first or packing them exclusively when I travel. They're just so comfortable, easy to wear and easy to style. Since spring is coming, they're on a pretty good sale right now too, so if you can find your size I highly recommend! They run a size large and I wear a small. You can see when I've worn them (and their different colors) here and here on Instagram as well as here, here, here and here on the blog. I've also been getting back into statement earrings as of late (ever since I found a way to store and organize them!) and decided I hadn't taken these blue heart earrings out for a spin yet and thought with all the blue I had going on, it would be a great time for it. They're super lightweight and I had no issues wearing them throughout the (3 hour) play. They come in 4 colors if you find blue isn't your style! The play itself I knew nothing about and had zero expectations for. I decided to invite Ashby as my +1 and we had a really great night. The play was long but it kept my attention and then the ending was like WOAH what just happened and then it was over. I think about it a lot so I guess that means that it was really something that stuck with me! If you have a chance to see it, I would really recommend! PS!!! A new Dudley Stephens restocked today!! If you missed their last restock they sold out within a couple of hours. Try and snag what you can, click this link and use code BOP20 (this is Grace's code) for 20% off at checkout. Totally agree, RTR has great coats! Also SO much navy here and I love it! 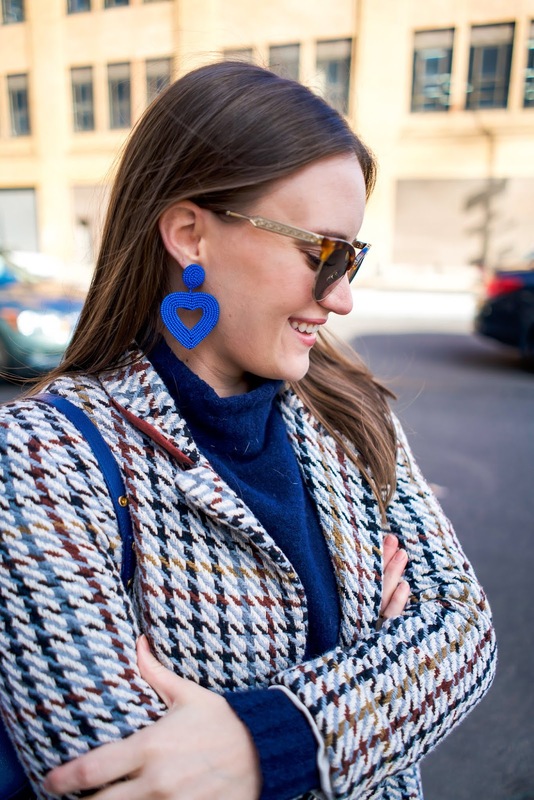 You've really got me on a statement earring kick. I've been trying to hold off on starting a collection but I always love your earrings!! That's a gorgeous outfit and the earrings are just a bonus! I love the coat, it's so pretty and seems really comfy even though it doesn't look very warm, I'm trying to find some transitional coats and jackets as I only pretty much have big winter coats. Really loving this combo! Especially those statement earrings - they are amazing! Ooooh I'm so obsessed with that coat! Love how simple you kept it underneath with a monochrome look, it really makes the coat stand out! I've only used RTR once but absolutely loved it! I should look into the unlimited program. Side note, I feel like I want every single outfit you wear! I wish I could have this look for work. 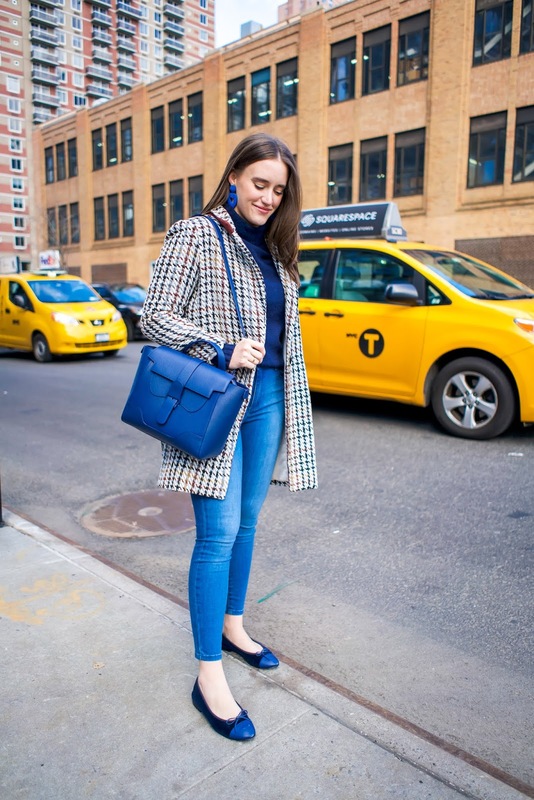 I am having MAJOR heart eyes for those Chanel flats!!! What a cute look! !